Understanding demand and supply forms the basis of studying economics as well as any management study. Today we would try to understand the demand curve and laws of demand along with its exceptions. In economics, Demand means that a buyer is willing to purchase an article as well as possesses the ability to pay for it. A mere wish without the ability to pay for the purchase or vice versa cannot be termed as demand. In other words, your wish of buying a Lamborghini won’t be enough to be termed as “demand” until you possess $200,000, to purchase it. What are the factors that affect demand? Let us take an example of Miss Julia, who likes one particular dress. If a price of another dress rises then logically, demand for the dress, which Julia likes, will rise as it will become more affordable.Similarly, when the accessories that go along with this dress show a fall in prices, Julia finds the entire set to be economical. How does a demand curve look? What does it represent? A demand curve is a left to right downward sloping curve on a graph that depicts the inverse relationship of the quantity demanded of an article and different price levels. 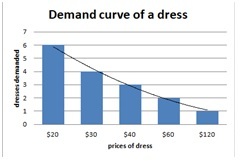 Let’s go on to understand demand and the law of demand using an example of Ms. Julia who has a ‘demand’ for a dress. Now, it is simple to understand that with $ 120, Ms. Julia will be able to buy 6 dresses when the price of the dress is $20 and 2 dresses when the price rises to $60 per dress. In short, we now understand that with a rise in price Julia demands less dresses and with a fall in the price, she demands more which in economics terminology means that there is an inverse relationship between demand and price of an article, hence having a negative slope. The law of demand is simply what we understood from the above example that with all other factors taken to be the same, a rise in price of an article leads to a fall in demand and a fall in the price rises the demand. So, there is always going to be an inverse relationship between demand and price of an article. These are some cases when the inverse relationship between demand and price does not hold good. In times of war people tend to hoard stuffs irrespective of the high prices because of the fear of not having it when war worsens. During economic depressions, again resort to buying more and more at higher prices due to the fear of being able to buy fewer articles on a future date when situation deteriorates. There’s something called the Giffen’s Paradox which occurs when the prices of daily necessities shoots up and people tend to cut down expenses on other articles to be able to buy this basic necessity. People of the elite class find it a matter of pride to buy articles whose prices are high than those which are low as in the cases of diamonds, artefacts, vintage vehicles etc. What is primary research in marketing? How to leverage secondary research in business?